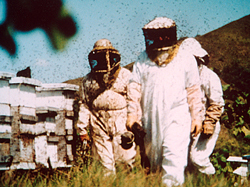 Beekepers in Panama walking through a cloud of Africanized honey bees. Much more defensive than the European honey bees we have in Delaware, these Africanized bees persistently try to intimidate people by flying around their heads. Q. How do you tell Africanized killer bees from our ordinary European honey bees? A. We cannot tell them apart from their appearance. The Africanized honey bee is roughly 10 percent smaller, but to distinguish one from the other we have to look at their DNA. We also can do a series of about 40 measurements of body parts and so we do it with a computer. Beekeepers recognize Africanized bees quickly, however, by their behavior. For example, if you disturbed a colony of European honey bees in our apiaries here at UD, the bees would tend to stay close to the hive to defend their colony. If you disturbed a colony of Africanized bees, however, the bees would explode from the hive to defend it from the outside by flying all around you, like a cloud, persistently trying to intimidate you. We standardize these comparisons, too, so we are not just measuring these differences by our perceptions. We have a little machine with an arm that waves up and down, and on the arm is a little felt flag. We turn the machine on for 30 seconds, and then we turn it off. Any way you want to measure it, on a scale of 1 to 10, with 10 being highly agitated, the bees in our apiary typically measure a 1 or 2 in agitation, with a range of stings on the felt flag probably zero or up to 10 or so within 30 seconds. In contrast, Africanized bees frequently measure about a 9 or 10 in agitation, with 400 to 500 stings within 30 seconds. Q. Should I pack up the kids and homestead in Alaska? A. I expect that Africanized honey bees will be disruptive to beekeepers and to agriculture a little bit, but I dont see them being a health hazard to the average person. Thats the stuff of movies. Since coming into the United States in 1990, the Africanized bee has caused 11 deaths. In some cases, this is because they stung people who were allergic to bees. In other cases, individuals received too many stings in too short of time. In contrast, about 30 people each year die from other bee, wasp and ant stings. So far, Africanized bees have been responsible for a very small percentage of deaths from stinging insects each year. In Texas, which is where the bees have spent most of the past 10 years, they are responsible for about .085 percent of the stinging deaths in that state. Q. Do Africanized bees have more venom in their sting? A. Actually the venom is the same and there is probably a little bit less because the Africanized honey bee is a little bit smaller. Q. If this is such a bad bee, why are you still a beekeeper? A. The Africanized bee isnt here in Delaware yet, but when it comes, the backyard beekeeper and the youth earning a 4-H merit badge and so on will stop doing it. Many commercial keepers, however, adjust to the new bee and continue with their business, while others just quit. But then there is a new group who begin as beekeepers who manage just fine with the Africanized bee because its all theyve known. They just dont take chances. Also in the Americas, there are the rural poor from countries like Panama who have gotten into beekeeping accidentally when all of a sudden a bee swam flies by and lands in a tree near their home. For these people, the bees are a brand new resource. These are free bees! The people just have to get them out of the tree and they do this with a clay pot or a straw hive they weave from grasses. The European bee didnt reproduce very much and so there werent swarms available. Also, it was expensive to buy beekeeping equipment and rural people dont have the money. Whats new now is that swarms are a resource and people find ways of dealing with the bees. This is subsistence agriculture. We have development programs designed to help them, of course. Q. Why do we have such an impression that these bees are so dangerous? A. Thats just because good news is no news. If one person dies from a bee sting, it surely will reach the newspapers because the press is playing to peoples fears. Africanized bees are just defending their hives, nothing more, whereas the media will sometimes use more colorful and active terminology to describe their behavior suggesting that they are out to get us, for example. The Africanized bee is more defensive, its true, but people are changing and adapting to this behavior because beekeeping is still a way of putting food on the table and paying their kids tuition. Q. Where are Africanized bees found in the United States? A. Africanized honey bees have been identified in six states so far. They initially came into southern Texas about 10 years ago and from there they spread more quickly to the west, to California. The bees are a serious problem in the cities of Las Vegas, Tucson, Phoenix and El Paso. The dry cities have the most difficulty with the bees because people are inadvertently giving them nesting sites. For example, homeowners often have their water meters right at ground level, or buried in the ground. It is moist and cool inside the metertwo things the bees need in the dry desertand then someone comes along and opens the meter to read it. Bees and people just dont mix. Africanized bees thrive in the tropics and they will love Florida when they get there. They have been interrupted many times from accidental introduction by sea and rail. The insects have even been found underneath trucks and campers, but we have extensive education program and traps set up in many locations so we can quickly identify and destroy Africanized bees inadvertently brought into the area. Q. What measures, if any, are being taken to keep these bees out of Delaware? A. Locally, we have traps set up in the port of Wilmington and in southern areas of New Jersey and Delaware where ships are anchored waiting for pilots to bring them into the bay. Beyond that, we have some advantage in that Delaware is above the 34th parallel, which is the latitude in South America where the behavior problems of the Africanized bee diminishes. At higher elevations in South and Central America, the bee is less defensive and not as dominating as you move from tropical and subtropical to temperate climatic regions. With our temperate climate in Delaware, the bees are likely to be easier to manage, and genetic turnover will take many years once the population arrives. Our European-origin honey bees are better suited to get through our winters, too, than the Africanized bee.